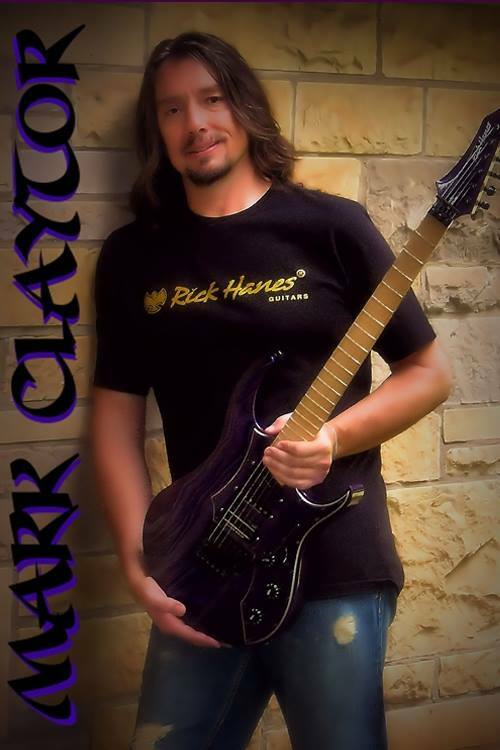 Guitarist extraordinaire Mark Claytor recently spoke with me about his life and his music. What follows are the raw facts of a musician who deeply fell in love with his instrument and created the sound he wanted. Not many musicians get to his level of personal accomplishment due to big dreams and unattainable goals. Mark Claytor is an example of making your passion…well your passion. James West: How does the story of Mark Claytor The Musician Begin? Mark Claytor: It all begins for me with Van Halen II that was before I started playing but when I heard that album I was like. What is that!? It was one of the first real albums I ever bought. Then I started discovering the other great bands that came before the mighty VH. Aerosmith was huge for me. Santana, ZZ Top, Frank Zappa, Robin Trower. I could go on and on. Then of course I got in to the 80’s metal bands. Still wasn’t playing but I was listening. A lot. My friend Nathan was playing at the time and he showed me a few things but I was still very much a novice. Then I saw the movie “Crossroads” with Steve Vai. That was it. I just had to figure this instrument out. So a couple of years later in ’88 is when things really started to click I was off and I’ve never looked back. Not once. James: How many bands have you played in? Mark: I’ve been in a handful of local bands. Nothing real big. Love to get together with other musicians to jam. I had a blues rock thing going that I really enjoyed. I really like getting together with those guys and just jamming some blues. Its kind of relaxing for me. Just feeling the groove and improvising. I love it. Shout out to Jerry, Larry and Jacob for listening to my endless solos. James: What inspires you to create music without vocals? Mark: Great question. I’ve always gravitated towards instrumental music. I don’t know why. I can tell you the first instrumental that I heard and thought. Wow he is telling a story with his guitar. No vocals just his guitar. It was Joe Satriani “Always with me always with you” that really stuck with me. Inspiration is a funny thing it comes and goes. But to be honest. The guitar inspires me. I pick it up and it just flows. Not always but when it does it just does. The creative process is inspiring to me. Listening back to something I’ve created is inspiring. Its inspiring for people to tell me they “hear” words when there are none in my music. That is a great compliment. James: Are there any types of music you turn to too refresh your creativity? Mark: Not really. I’ll listen to about anything. I will say that when you can see or hear a person really pouring out their soul through the music they are playing, that puts me in a creative mood. Sometimes just picking up the guitar after a few days away will make me want to create. A different guitar or amp can inspire me to create as well. James: As a musician, what is some advice you would give to someone who wants to play an instrument? Mark: Do it! Take some lessons. Learn some basic theory and apply that. In my case that really helped me put some pieces together. That being said I am totally a “ear player” I can learn faster by ear then if I had the music in front of me. Don’t stop if you want to get better. It may seem impossible at times but it can and will be a very rewarding experience. It all depends on what you want to do with your chosen instrument. Want to rock Royal Albert Hall? Don’t stop until you get there. Want to strum a few chords on your front porch every night? That’s awesome too. Don’t stop until you can. James: Moving to your album “Uprising”, what inspired you to create it? Mark: Oh man. That was a very hard time for me in life. The death of loved ones. Relationships were falling apart. I went through a horrible anxiety and panic attack phase. Most of my gear was stolen. I was done mentally and physically. I really thought about quitting. But I worked through it all. Had some tax money, got new gear and inspiration just came flooding back. That’s were the title comes from. Rising up from the bottom. Uprising. James: You have many feel good tracks on this album but what would you say the message you want to get across to the listener is? Mark: That is the great thing I’ve discovered about my music. Or any music for that matter. I can write a piece of music with a certain thought in mind that will be the basis for the song. But when someone else listens they get a completely different meaning or feeling. I put every ounce of heart and soul into anything I write. I hope anyone that listens can hear that too. James: With “Uprising” released what is next for you? Mark: Keep going! I’m writing for the next release now. I’ve got five songs in demo form and I’m also very proud to say that I’ve had some great musicians want to help me out on this one. I’ve got Jimmy Pitts on a couple of songs playing keyboards. Such a great player I’m honored he would play on my tunes. This one will also have some guest vocalists featured on it as well. I’m also hoping to do a few clinic dates this fall with another great guitarist Aaron Roten. Amazing player and it will be a honor to share a stage with him. So I’m going to continue to do what I do. Play my guitar. There you have it. Mark Claytor is a talented musician that write from the heart and always searches for inspiration even in the worst of life’s situations. That should reside with us all and inspire all of us to keep pushing forward and to not give up on our passions. Claytor, Contrast, Control, Feature, Interview, James, Mark, West, Writing. Bookmark.